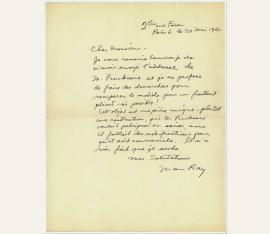 "Man Ray was an American visual artist who spent most of his career in France. 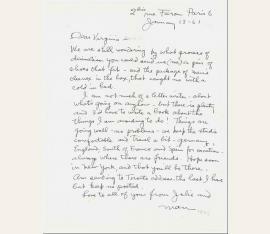 He was a significant contributor to the Dada and Surrealist movements, although his ties to each were informal. He produced major works in a variety of media but considered himself a painter above all. He was best known for his photography, and he was a renowned fashion and portrait photographer. 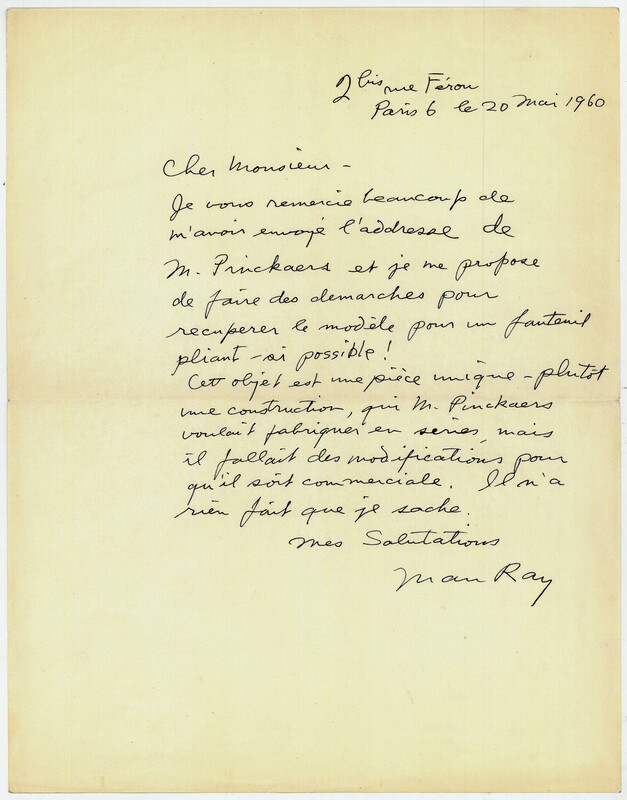 Man Ray is also noted for his work with photograms, which he called ""rayographs"" in reference to himself. 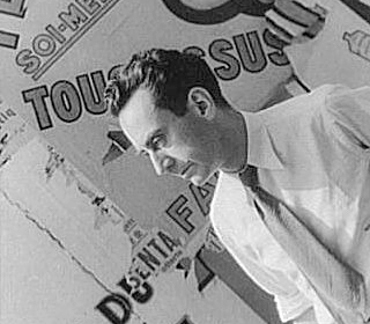 In 1999, ARTnews magazine named Man Ray one of the 25 most influential artists of the 20th century." i. e. Michael Rudnitzky, American artist (1890-1976). Autograph inscription signed. In: Man Ray: Self Portrait. Boston und Toronto. XIV, 402 SS. Leinen mit gepr. Rückentitel und bedr. Originalschutzumschlag. Gr.-8vo. 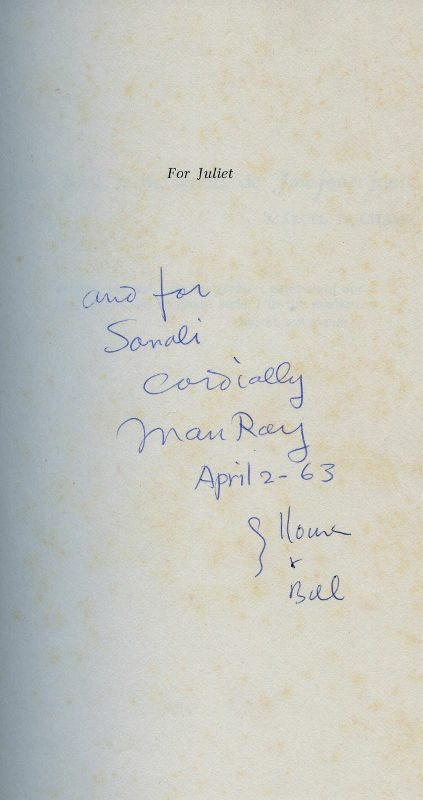 Inscribed "and for Sonali cordially Man Ray April 2 - 63 [...]" under the printed dedication "For Juliet". i. e. Michael Rudnitzky, American artist (1890-1976). 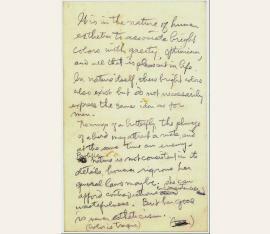 Autograph manuscript (fragment?). N. p. o. d. Large 8vo. 2 pp. "It is the nature of human esthetics to associate bright colors with gaeity [! ], optimism, and all that is pleasant in life. 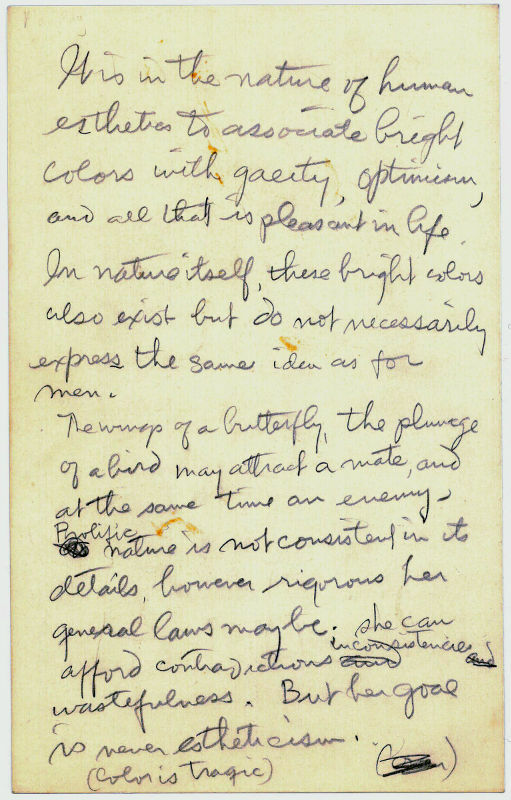 In nature itself, these bright colors also exist but do not necessarily express the same idea as for men. The wings of a butterfly, the plunge of a bird may attract a mate, and at the same time an enemy. Prolific nature is not consistent in its details, however rigorous her general laws may be; she can afford contradictious inconsistencies wastefulness. But her goal is never estheticism. (Color is tragic) This tremendous effort with such miserable results. Almost no effort. Then an easy masterpiece. | An age in which size + weight dominate | Bever heard of anything being criticized for dying ... [...]". - In pencil..
(Emmanuel Radnitszky, dit), Photographe américain (1890-1976). 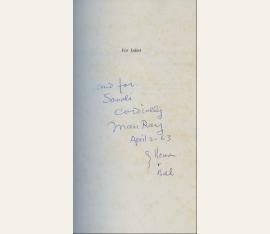 Autograph letter signed ("Man"). Paris. Une page in-4. 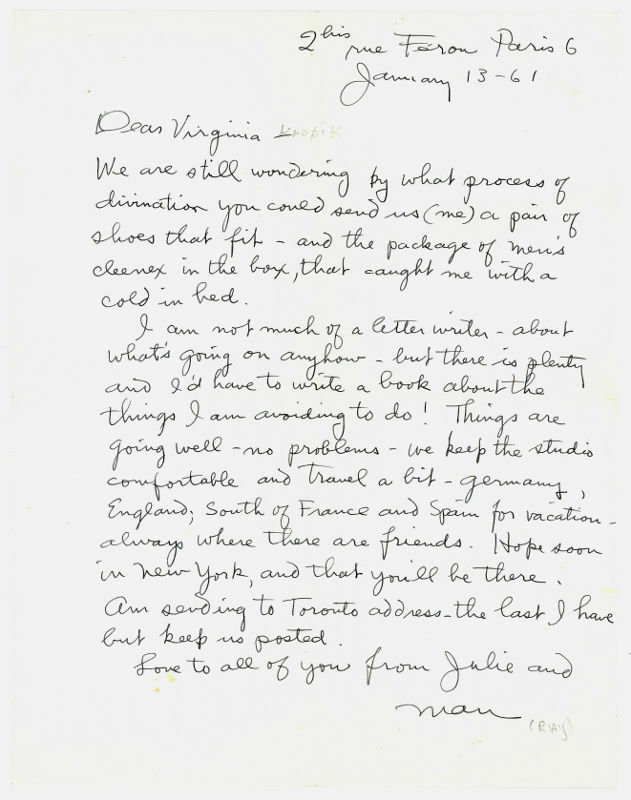 To Virginia Knopik, an American friend: "We are still wondering by what process of divination you could send us (me) a pair of shoes that fit - and the package of men's Cleenex [!] in the box, that caught me with a cold in bed [...] Things are going well - no problems - we keep the studio comfortable and travel a bit - Germany, England; South of France and Spain for vacation, always where there are friends. Hope soon in New-York, and that you 'll be there. Am sending to Toronto address - the last I have but keep us posted. Love to all of you from Julie and Man". American visual artist (1890-1976). Autograph letter signed. Paris. 4to. 1 page. To an unnamed addressee: "I thank you for having sent me the address of M. Pinckaers and I am thinking of taking steps to get back the model for a folding armchair, if possible! This object is a unique piece or rather a construction that Pinckaers wanted to fabricate in series (quantity), but modifications were necessary if it was to become commercial. He did nothing more as far as I know [...]" (transl. from the French original).